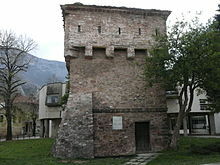 So-called "locked tower" in Theth, north Albania. A distinctive type of Ottoman tower houses (singular: Albanian: kullë; Bulgarian: кули, kuli; Serbian: kуле, all meaning "towers", from Persian qulla, meaning "mountain" or "top" via Turkish kule) developed and were built in the Balkans (Albania, Bosnia and Herzegovina, Montenegro, Bulgaria, Greece, Kosovo,[a] Macedonia and Serbia), as well as in Romania, after the Ottoman conquest in the Middle Ages by both Christian and Muslim communities. The practice began during the decline of Ottoman power in the 17th century and flourished until the early 20th century. The tower houses were typically made out of stone, rose three or four storeys, and were square or rectangular in shape. They served both military (defence, watchtower) and civilian (residential) purposes in order to protect the extended family. Types of towerhouses in Albanian architecture existed before the Ottoman invasion of the Balkans, especially in Gjirokastër. Albanian Kullë are predominantly found in the north of the country, with notable instances in the south being Berat, Gjirokastër, Himara, and Këlcyrë. Kullas are heavily fortified buildings with small windows and shooting holes, because their main purpose was to offer security in a fighting situation. The first Kullas that were built are from the 17th century, a time when there was continuous fighting in the Dukagjini region, although most of the ones that still remain are from the 18th or 19th century. They are almost always built within a complex of buildings with various functions but Kullas in towns exist mostly as standalone structures. They are also positioned within the complex of buildings that they exist in a way that makes it possible for the inhabitants to survey the surrounding area. Kullas in towns are usually built as standalone structures, while in villages they are more commonly found as a part of a larger ensemble of kullas and stone houses, usually grouped based on the family clan they belonged to. Certain kullë were used as places of isolation and safe havens, or "locked towers" (Albanian: kulla ngujimi), intended for the use of persons targeted by blood feuds (gjakmarrja). An example can be found in Theth, northern Albania. There are also instances of fortified tower-houses in Gjirokastër built in the 13th century, predating Ottoman conquest. Kurtpashov Tower in Vratsa, Bulgaria. Examples of fortified residential towers in Bulgarian lands include the 16th-century Tower of the Meshchii (converted into a clock tower in the 19th century) and the 17th-century Kurtpashov Tower in Vratsa in Bulgaria's northwest. 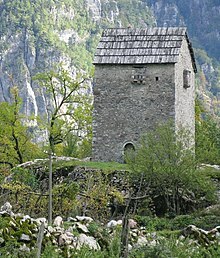 The Pirgova (Pirkova) Tower, similar in purpose but different in design, was built in the southwestern town of Kyustendil in the 14th or 15th century. 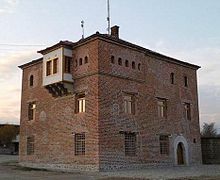 The tower in Teshovo in south Pirin, noted for its relatively sophisticated water conduit and sewage system, is also thought to date to the early Ottoman rule of Bulgaria and may well have been the residence of a local bey. Hrelyo's Tower, built in 1334–5 by prōtosebastos Hrelja in the courtyard of the Rila Monastery, is a pre-Ottoman example of an autonomous tower that served residential as well as defensive purposes. Besides featuring habitable floors, the 75 feet (23 m) Hrelyo's Tower also includes an Orthodox chapel on its top floor. Tower houses in Vatheia, Mani peninsula, Greece. The tradition of towerhouses in Greek architecture existed in pre-Ottoman, Byzantine times. Although the Ottoman-period architecture has almost completely disappeared from Greek urban centres, there are scattered examples of Ottoman tower houses built in the Ottoman period, the early modern period, and during the chifliks. 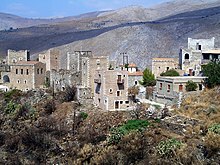 Alongside the fortified houses of Mani (called xemonia), there are also residential towers (koule) of Ottoman origin. Greek architects have claimed that the Albanian tower house developed under Greek influence. In Kosovo the traditional two- or three-storey kullas were built mainly between the 18th century and the early part of the 20th century. They are constructed entirely of locally excavated stone, though some incorporate decorative wooden elements in the upper floors. Historically the kullas have been inhabited solely by men, with women and children housed in a connected annexe. The exterior walls are a meter thick at ground level but become thinner towards the roof. The small openings that play the role of windows are called frëngji, and their tiny size is due to the kulla's historical use as a fortification and as a means of protection against attacks. Aspects of kulla life are strongly influenced by Muslim culture, especially the segregation between men and women in social spaces and entrances. The kullas' characteristic double sets of entrances and staircases (main and side) reflect this division, since only the side entrance and staircase lead to the private family quarters. Kullas are also well-suited to the Kosovan climate as their construction allows them to remain cool in the summer and warm during winter. Examples include Jashar Pasha's Tower, Haxhi Zeka's Tower, Xhafer Syla's Tower, Mazrekaj Tower, Janjevo Tower, Tomić's Tower. Ganić tower house, in Rožaje. Nenadović's Tower, in Valjevo, Serbia. Nenadović's Tower (Serbian: Кула Ненадовића) was built by Jakov Nenadović in springtime 1813 in Valjevo, Šumadija. Initially it was used by rebels during the First Serbian Uprising for military purposes. Ottomans later used it as prison. Culă, towers built by boyars in what is today Romania. ^ a b c Grube-Mitchell 1978, p. 204: "a distinctive form of defensive tower-dwelling, the kula, developed among both the Christian and the Muslim communities during the insecure period of the decline of the Ottoman authority in the 17th century ..."
^ a b Greville Pounds 1994, p. 335: "In southeastern Europe, where the extended family was exemplified as nowhere else in the western world, the home itself was often protected, giving rise to the kula or tower- house." ^ Marika McAdam; Jayne d' Arcy; Chris Deliso; Peter Dragicevic (2 May 2009). Western Balkans. Lonely Planet. p. 92. ISBN 978-1-74104-729-5. Retrieved 11 May 2012. ^ Internationale Tourismusattraktionen in Mittel- und Südosteuropa. Österreichisches Ost- und Südosteuropa-Institut, 1999, p. 2. ^ Strnadel, Leslie; Erdley, Patrick (2012). Bulgaria (Other Places Travel Guide). Other Places Publishing. p. 110. ISBN 9780982261996. ^ Kay, Annie (2008). Bulgaria: The Bradt Travel Guide. Bradt Travel Guides. p. 138. ISBN 9781841621555. ^ "Pirkova Tower". Tourism Kyustendil. Retrieved 18 May 2012. ^ "Кулата в Тешово с първото ВиК" [The tower in Teshovo with the first water supply]. Стандарт (in Bulgarian). Стандарт нюз АД. 2011-08-04. Retrieved 18 May 2012. ^ Пелтеков, Александър (2001). "Старата кула" [The old tower] (in Bulgarian). Teshovo.com. Retrieved 18 May 2012. ^ Thomas, John Philip; Hero, Angela Constantinides; Constable, Giles (2000). Byzantine Monastic Foundation Documents: A Complete Translation of the Surviving Founders' Typika and Testaments, Volume 1. Dumbarton Oaks. p. 126. ^ Howard Davis (8 June 2006). The Culture of Building. Oxford University Press, USA. pp. 140–. ISBN 978-0-19-530593-7. ^ Sigalos 2004, p. 48: "The Albanian kula, or tower house, for example, was regarded to have developed under Greek influence (Megas 1951, 1967)." 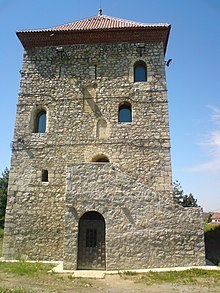 Wikimedia Commons has media related to Tower houses in the Balkans. Gjergj Fishta (3 March 2006). The Highland Lute: (Lahuta E Malcís) : the Albanian National Epic. Translated by Robert Elsie; Janice Mathie-Heck. I.B.Tauris. pp. 435–. ISBN 978-1-84511-118-2. Retrieved 10 May 2012. Greville Pounds, Norman John (27 May 1994). The Culture of the English People: Iron Age to the Industrial Revolution. Cambridge University Press. ISBN 9780521466714. Retrieved 10 May 2012. Sigalos, Eleftherios (2004). Housing in medieval and post-medieval Greece, Volume 1. Archaeopress. ISBN 9781841716411. Retrieved 10 May 2012. John H. Stubbs, Emily G. Makaš; Mounir Bouchenaki (2011). Architectural Conservation in Europe and the Americas. John Wiley and Sons. ISBN 9780470900994. Retrieved 11 May 2012. Rassam, Sahar (September 11, 2001). Kulla: A Traditional Albanian House Type in Kosovo (PDF). UNESCO-ICOMOS World Millennium Congress, Session 2 (continued) - Historic towns. Paris.